We write to highlight our continuing concerns about the Court Facilities Program. More Long Bitching: OK, I admit it – I’m obsessed with the new Long Beach Courthouse. I went back last week and waited while a woman with a baby carriage went through the security checkpoint in front of me. Then I heard one of the guards ask another guard if it was all right to bring in baby food in a jar. Apparently he wasn’t up on the latest TSA rules. If the place looks like an airport, those rules ought to apply. I also forgot to mention the acoustics last week. Whoever designed this place apparently forgot to think about that. When you walk into one of the mostly glass-enclosed clerk’s offices, the sound of the line – even a small line – is seriously amplified. It’s like one of those fancy restaurants where you can barely hear the person across the table from you. Except here you can barely hear the clerk six inches in front of your face. In most cases, this is just as well. But even though you’re drowning in unintelligible sound, at least you can watch the high-definition monitor suspended above showing a short rotation of oddly random ads. One for designer water. One for a “Street Fighter” video game. And one for the Maserati Gran Turismo. I looked at the crowd around me in the “family/probate” section where they keep the civil files. I couldn’t picture any of them running out to buy a Maserati. Someone may want to reconsider the target audience. Then there’s the piece of vaguely ironic symbolism in front of the building – four giant cement and mutant honeycomb-metal columns that you might think are pillars. They don’t hold anything up. We are concerned that Mr. Policzer’s comments reflect a public perception that the Court Facilities Program administered by the Judicial Council and the AOC is disconnected from the reality of 80 closed courthouses and the loss of more than 2500 court employees. The Alliance has always maintained that the local courts of this state are in desperate need of new facilities. What is missing from the equation is a clear connection between cost and available resources. Please recall the report to the Judicial Council of October 26, 2012, announcing the termination of seven needed court construction projects. Yet in Yolo County the Judicial Council is proceeding with the construction of a $161 million, 163,000 square foot courthouse for 10 judges [pictured here]. In Kings County, construction is proceeding on a $123 million, 144,000 square foot courthouse for seven judges [pictured here]. 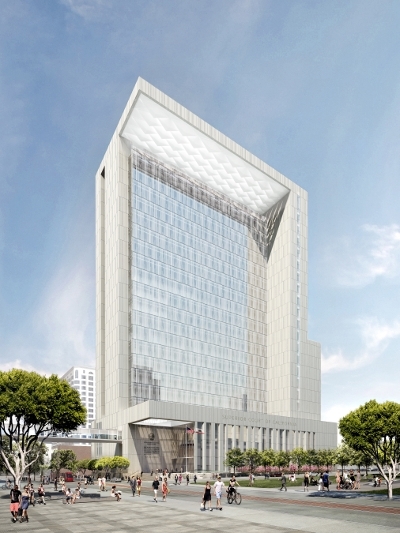 In San Diego, plans are being finalized for a $555 million, 704,000 square foot courthouse with 71 courtrooms [pictured here]. The Kings County, Yolo County, and San Diego Superior Courts need new facilities and they are deserving of them. We do not fault the judges of these courts and others for pursuing plans developed and costed by the AOC, but these facilities are costing from $8 to $16 million per authorized judgeship. By similar accounting, the Los Angeles Superior Court would need $4 to $5 billion for court construction. Total court construction throughout the state to replace outdated facilities would require $16 billion of capital investment. Our concern is that none of these facilities have been costed with an eye toward total needs throughout the state. Our state may never have these billions to spend, nor will court facilities be the only outdated state facilities needing repair and replacement. We are concerned that the state will be left with extravagantly funded courthouses in just a few locations, while courtrooms and courthouses throughout the state remain closed and public access remains frustrated. Once the public perception takes hold of these discrepancies and inequalities, it is the judges of this state who will be blamed. • Has the AOC used best practices in managing and planning construction projects? court needs are left without support? • Has the AOC improperly used funds intended by law for capital improvement for ordinary maintenance under guises such as “bundling”? the amount of deferred maintenance on old courthouses? considering the new reality of budget reductions, diversion of construction revenues and the likely long delays in getting new construction on line? • Would the court construction program be better administered by the Department of General Services or an independent agency rather than the Judicial Council? For instance, does the Judicial Council and AOC staff have the core competence to oversee such a massive construction program and real estate portfolio? • Are there available funds that can be redirected to trial court operations for the immediate future? Our state cannot afford extravagance and mismanagement when our courts are in crisis. We remain committed to securing an audit of the operations of the AOC. It was announced late today that Donald Trump was going to buy the Long Beach Courthouse. The purchase price was not disclosed. ” I just love this building. The holding cells have a strength and masculinity that is in keeping with the Trump style while the new pink courtrooms have the gentle touches so admired by the Trump women” said Donald Trump today in announcing the purchase. ” Cost was no object to the private developers and to the AOC and cost will be no object to me. I intend the Long Beach Courthouse to be the first of an international group of courthouses” he added. Mr.Trump confirmed that he had employed an “internationally famous” designer to build a 65 foot screw sculpture dedicated to the stupid bureaucrats of the AOC. Also planned are offices within the courthouse to house Trump Bail Bonds, The Trump Restaurant, the Trump Information Center, and the Trump Counseling Centers. Summary- No revelations of condo reimbursement, however, we question the need for the people of the state of California paying for San Francisco hotel rooms when these people chose jobs that were based in San Francisco. There are over two dozen AOC employees that commute greater distances to be at their jobs in San Francisco and are not entitled to rent hotel rooms. Leadership should lead by example and reimburse the state for these charges. You accepted a San Francisco based job. Deal with it much like rank and file does. And last – JCW has come out in support of AB 566 by Assemblyman Bob Wieckowski. When local courts that are suffering fail to assail the AOC over their own haphazard contracting practices, when contractors permanently replace state workers in local courts simply so that they can cut wages and benefits, we have a series of problems. Unfortunately when everyone looks the other way at these practices someone needs to step in and be the adult and say that not only is this morally reprehensible but fair consideration was not given to those who dedicated their lives towards a career in the court system only to be shortchanged by that court system. While we may not agree on everything this bill does it represents a decent start in guiding the boondogglers towards doing right by the public and their own employees. Really? The California Judicial Branch has sunk so low and has strayed so far from their mission that they’ve gone into the business of hawking designer water, violent video games, and obscenely expensive luxury automobiles inside the courthouse? Really? Yeah. Someone really ought to reconsider the target audience. W.D., When you start mixing the private sector, where profits are King and everything is done in the name of stockholder interests, with the public sector, this is the cognitive dissonance that results. Courthouses are supposed to be solemn places, dignified places. Places where the Rule of Law is sacrosanct. Places where who is profiting from whom is irrelevant. But we live in a corrupt, decadent world where such distinctions and considerations are considered hopelessly old fashioned and out-of-step. Is it any wonder that our youth fail to appreciate their civic duty as citizens of the republic when even our courthouses cater to the consumer-centric, pop-culture, profits-above-all world that surrounds us? If CJ Tani really is interested in enhancing our young citizens’ appreciation for our great republic, she should focus on cleaning up her own house first. No truer words were ever stated, R Campomadera. And the fact that she has had 3 plus years to do so, and hasn’t, says all anyone needs to know about current branch administration. The only house cleaning that has happened in that time is changing the names of the people who are sweeping the dirt under the rugs. And last – JCW has come out in support of AB 566 by Assemblyman Bob Wieckowski. I can’t seem to get my comment to show up. Also, take a look at these hideously glorious pictures of the new Long Beach Airport — oops, I mean Courthouse. I read somewhere that the muckety-mucks in the Legislature are violating their own rules against naming a structure or building after someone in their “club” while that person is still alive. Seems they can’t help themselves; they do it constantly. (It will always be the SF-Oakland Bay Bridge to me). This obsession and compulsion by the self-congratulatory back-slappers is called an Edifice Complex. Thank god for the ACJ. May they live long and prosper. Somehow it was marked as spam. Unspammed and approved. Great links and comments Deliah. Slide 25 is my favorite as it really does look like the signs at an airport terminal. I’m not a fan of modern designed courthouses because in 20-30 years they look really dated. For example, the main courthouse for Orange County in Santa Ana was modern in the 1960’s but today it does not look modern at all. The same can be said for the Sacramento Courthouse. It’s sort of like how at Disneyland the land of tomorrow (peoplemover, mission to mars, rocket ride, Captain EO) doesn’t look very futuristic today and is having to be redone. In contrast the New Orleans section of Disneyland is timeless and forever dignified. George Lucas knew this to be true for his movies too and made the ships look old (Millenium Falcon) as they are then timeless. In contrast the Star Trek enterprise is constantly being remade in the movies so it remains “modern” in appearance. Same concept applies to the lodges at the National Parks. They are all timeless and will never need to be redone (just maintained). The fortress look is also not appropriate as it is a public place for debate of issues not bunker for judges with +95% of it hidden from public view. Nevertheless, I am happy to see LB get a new courthouse as I used to watch trials there as a college student in the 1990’s and it was so run down even back then. That community really deserved a better courthouse and I am glad to see they have a new building. It’s too bad it had to cost $2 billion to replace the old one. It’s cost overruns have also impacted many other courts/communities who won’t see new courthouses they too deserve. It also comes on the backs of many court employees who the AOC knew they could not be protect in the great recession having pushed and gotten $5 Billion in bonds rather than fighting to defend the existing courthouses and staff they already had. They gambled away the futures of 2,500 employees and many local courts. That was all well and good for them and a safe bet though since almost none of their jobs in the AOC were at risk and they’d get more AOC staff for “courthouse construction”. The only two who did have to leave (Vicrkey and Overholt) for the CCMS and Long Beach scandals got their full pensions on six figure salaries and moved to Arizona. California taxpayers get the tab for that too. There’s that “culture of control” thing at 455 Golden Gate Avenue rearing its ugly head again. Published today, Friday, September 27, from Courthouse News Service, by Maria Dinzeo. (CN) – A bill on Gov. Jerry Brown’s desk would restrict courts’ ability to outsource jobs to contractors, after a fierce lobbying battle between judges saying the bill crosses the line into their turf and union reps arguing that the judiciary should follow the same rules as the rest of California government. The bill, AB 556, says courts can hire private contractors only it can be demonstrated that the switch would save money, among other conditions. “In our opinion this bill is an overreach, not only into our discretion but into good business practices to reduce costs at a time when we have less funding,” Presiding Judge Laurie Earl of Sacramento said in an interview. Introduced by Assemblyman Bob Wieckowski (D-Fremont), AB 566 establishes standards for private contracting by the courts that are similar to those in place for community colleges, public libraries and school districts in California. In its language, the bill conditions private contracts on a demonstration of savings. “The trial court shall clearly demonstrate that the contract will result in actual overall cost savings to the trial court for the duration of the entire contract as compared with the trial court’s actual costs of providing the same services,” it says. The bill requires each court to report to the Legislature’s Joint Legislative Budget Committee and the chairs of both the Senate and Assembly judiciary committees on whether the contract resulted in court employee firings and whether their work is being replaced by contractors. It passed with big majorities out of the judiciary committees for both houses in June, passed with almost majorities of almost two-thirds on both house floors this month, and moved to the governor’s desk late Wednesday. Senator Noreen Evans (D- Santa Rosa) who chairs the Senate Judiciary Committee voted for the bill both in her committee and on the floor. Evans also sits on the rule-making body for the courts, the Judicial Council, and regularly supports the judiciary’s position on issues before her committee. “I am not unsympathetic to the issues that are raised by the Judicial Council,” Evans said at the June hearing on AB 566. She did not set out her reasons for voting in favor of the bill that passed her committee on a 5-2 vote. She said the bill’s effects are also too broad and would cover, for example, family law mediators who work under contracts. In an email Thursday morning, Wieckowski explained the impetus for the bill. He said it came from the firing of the Placer County court’s entire court reporting staff and replacement with private contractors. The court executive office in Placer is Jake Chatters who also helped promote a bill advanced by the Administrative Office of the Courts that would have required the press and public to pay $10 to look at a public file. That bill was killed in budget negotiations earlier this summer. In a letter opposing Wieckowski’s bill restricting private contracts, Chatters defended his court’s actions. “If it had not been this decision, the court would have laid off additional clerk’s office and courtroom staff, resulting in direct impacts on access to justice,” wrote Chatters. He said the private contracts resulted in $600,000 in savings. Wieckowski answered that the court employees had agreed to reduce their wages and benefits to the level of the private contract, but Chatters went ahead and fired them anyway. The courts’ administrative office argues otherwise. An analysis submitted by the judiciary’s lobbying arm, a division with the Administrative Office of the Courts, estimates the new law will cost courts $20-$30 million. That position is supported by letters from courts in Butte, Shasta, Siskiyou, Inyo, Tuolumne, Sutter, Marin, Napa, Solano, Sacramento, Fresno, San Joaquin, Santa Cruz, Ventura, Tulare, Los Angeles, Orange and San Diego. “If courts have no flexibility in this area, additional layoffs and furlough days will result with the passage of this legislation,” wrote Presiding Judge Paul Beeman from Solano. “Our ability to contract for personal services is critical to our ability to get the job done,” wrote Presiding Judge Gary Hoff in Fresno. “If enacted, AB 566 would lead to increased costs and, given the court’s severe funding constraints, could further diminish access to the court,” wrote Presiding Judge David Wesley in Los Angeles. After several years of deep budget cuts, courts in California have laid off hundreds of court workers, an onerous undertaking that has put them at odds with the California Court Reporters Association and the Service Employees International Union. “Nobody knows more than SEIU members how bad the cuts have been,” said Castro. She said Placer County court reporters had offered a 32 percent wage cut, higher pension contributions and for two reporters to retire early. “The court did not even consider the reporters’ offer,” Castro said. Now the bill’s fate lies with Governor Brown. In urging the governor’s signature, Wieckowski focused on the albatross that still hangs around the neck of the court administrative office, a failed $500 million effort to create a computer software system for the courts. “The court computer fiasco where the Judicial Council wasted a half a billion dollars of taxpayers’ funds on a failed computer system developed by a for-profit company showed very clearly that the judicial branch needs accountability too, like all branches of government, to ensure the taxpayers’ dollars are being used efficiently,” he wrote. Culture of control and oppression I’d call it. Jake’s on Team George and on his way to “leadership” in the AOC. Jodi Patel was who got him the Exec Officer job for Placer when they went into receivership from the AOC and she promoted him within Sacramento when she was the Exec there. He was in charge of CCMS for Sacramento but jumped ship to Placer so the fallout of it all never stuck. It does not surprise me at all to see Jake choosing to fire court reporters or proposing a fee on the press. In Sacramento the National Center for State Courts wanted to do a survey of the work being done by the clerks and the judges. The judges refused to have the survey include questions about their performance. I said this is a national survey we did not even create but that the National Center made up and it was being used in many courts around the state/ nation without question. The judges didn’t want it with those “judge related questions” I was told by the Exec Office. I suggested Roger Warren, who was a “resident scholar” at the AOC, a former PJ from Sacramento, and former head of the National Center be invited to come and speak to the Sacramento Bench about the importance of being open to comments (both good and bad) from the public. Jake killed that and refused to bring him in or have me contact him. I gave up and did it their way. The court hired students to do the survey without those questions but it looked really bad to me and to the analysts at the National Center that the judges were unwilling to hear the comments of the public they “serve”. It made me think this court does not want to hear possible critics of the bench but is happy to hear about the problems with staff. What kind of leadership/example is that? Not fair and it shows no class! So it is no surprise to see Admin in Placer and the AOC still supporting legislation for employees to get their jobs cut. How about outsourcing the AOC duties to state agencies and their jobs if that is how the game is gonna be played? Get General Services to build the court buildings. Get the Office of Technology to build the computers. Get CalHR to take over the hiring of court staff. Gut the AOC down to 200 employees down from 1,000 if that is how it’s gonna be. I hope Brown signs this law and checks the branch leaders at the AOC and trial courts for all of this crap it has done to court employees. Start treating court employees as state employees which means respectfully like everyone has to in CA government. Hell I was laid off after 9 years of service with my trial court (unrepresented employee) and the layoffs were not even done based on senority. Not based on performance evaluations. Not based on the budget even (the court had 17 million in reserve they didn’t want to spend at the time even though the legislature demanded trial courts spend down their reserves). Court Admin has nasty politics and there are no standards for court administrators to have their jobs. They come and go and do mean stuff in the meantime at the request of their PJ’s. I am happy to see the unions speak up for court workers. Their administrators sure wont. The staff in Sacramento despise their new Exec Officer and have no loyalty to her as she never worked her way up in the organization. It is truly a culture of control and the other branches/unions are the best hope for court workers. Gotta love this woman! Elaine Howle is doing an excellent job. Never, never, never give up. And never, ever forget. The Judicial Council of California, Administrative Office of the Courts, Conference Services Unit seeks proposals from hotels for sleeping rooms, February 18-21, 2014 in Sacramento, California (prefer downtown near State Capital). Proposals must be received by END OF BUSINESS DAY Pacific Time, Thursday, October 10, 2013. Further information regarding this solicitation is set forth in Request for Proposals (RFP) No. CRS SP 064. This notices a reduction in hours from 9:00 AM to 4:00 PM Monday through Thursday and 9:00 AM to 3:00 PM Friday; and also being closed Monday through Friday from 12 PM to 1 PM.  This change applies to all Red Bluff Court Office locations as our Corning Branch closed as of July 1, 2013.  A document drop box will be provided at all locations to receive documents during the hours the court is closed to the public. All drop boxes will be checked throughout the day and at 8:00 a.m. each court business day. Documents will be received and filed the day they are dropped. Any document dropped after 5:00 p.m. will be received and filed the following court business day.  The Tehama Superior Court has taken this action due to ongoing budget cuts and a reduced work force. Through attrition, the court clerks’ office staff has been reduced by approximately 20% over the past three years, with no replacements being hired due to fiscal constraints. The number of filings that the court has received in the same period, however, has remained constant. This adjustment to the court’s public office hours announced in this notice will allow staff to eliminate backlog that has accrued in multiple areas of the court and give necessary time and attention to new work. It also will allow all employees to participate in meetings and trainings, facilitating internal communication and allowing staff to keep abreast of any changes in law or policies and procedures, which is necessary to ensure a continued high level of service for all court users. What other government agency can you name that is open to the public only 20 hours a week? I call that the phone call that never happened. What is striking is how unnecessarily opulent the Long Beach courthouse is. Do we need the pillars to nowhere, the garden in the courtyard, the airport like ceilings ? Didn’t any of that occur to the people running the Judicial Council and AOC ? Didn’t anyone at the Judicial Council or AOC question the ultimate 2.3 billion dollar price tag? I will say again I am troubled and appalled by this incredible waste of taxpayer money and the fact that no one accepts responsibility for any of this. This is like CCMS and all the other excesses of the anti-democratic Judicial Council and AOC. No respect for taxpayer dollars, no respect that we have budgetary limits and no one courageous and honest enough to say we messed up and we need to change. So while some sit in the lap of luxury, many others lose their jobs, wait in endless lines, or wait as their cases can’t be heard in a timely way. Yet it is business as usual at the crystal palace, with new hires, raises all around, and the insiders laughing and giving themselves ” Ronald George” and ” William C. Vickrey” awards. What a sad result for the once proud and effective California courts. Only someone who has no ethics, no conscience, and has completely lost their moral compass would be “honored” to receive an award named after Ronald George or Bill Vickrey. I find it HILARIOUS that they blame the legislature for long beach when they knew all along that they were betting the farm (and a whole lot of other courthouses) that the legislature would just pick up the tab when they set out to build it. It was one of those political deals that was rushed to the front of the courthouse line at the cost of what, 11 other courthouses? Can someone please explain to me why local trial courts have been forced to close numerous branch locations while we pour over a billion into one extravagant courthouse with a reflection garden , juror sofas and tons of dramatic looking glass ? Is anyone at 455 Golden Gate prepared to justify this? The legislature needs to conduct a full audit of the AOC , ( if Justice Hull will allow it ), followed by legislation to defund the AOC and Judicial Council . We’ll, Lando, the Office of the Chief Justice, and her minions at 455 Golden Gate Avenue, we’re too busy with deciding how much they could sell ads for on the overhead monitors, who among them they were going to name the building after, the right color for designer sofas, the obvious need for a reflection garden, and pulling the wool over the eyes of the State Legislature, to pay attention to little details like the multi-billion dollar cost and trial courts imploding all over the State. This notices a reduction in hours from 9:00 AM to 9:00:30 AM Monday through Thursday and 9:00 AM to 9:00:15 AM Friday; and also being closed Monday through Friday from 9:00:30 AM to 5:00 PM.  This change applies to our locations that remain open after our other branches closed as of July 1, 2013. Since we have no employees we’re not really sure which locations this change applies to as there is no one there to open the door anyway.  The Confusion Superior Court has taken this action due to ongoing budget cuts and a reduced work force. Through attrition, the court clerks’ office staff has been reduced by approximately 100% over the past three years, with no replacements being hired due to fiscal constraints. The number of filings that the court has received in the same period, however, has remained constantly the same, or perhaps less, but we really have no way of knowing since no one works here. This adjustment to the court’s public office hours announced in this notice will allow the non-staff to watch the backlog that has accrued in multiple areas of the court and give the necessary time and attention to new work, that being no time at all. It also will allow all non-employees to participate in meetings and trainings, facilitating internal communication and allowing non-staff to keep abreast of any changes in law or policies and procedures, which is necessary to ensure a continued high level of non-service for all court users. Confusion Superior Court, Attn: Tani, Grand Pubah, 811111111.5 Bendover Street, Confusion CA, 9123456-78. Defund the AOC! Long live the ACJ! Only delivery by the Pony Express is permitted per J Hull. Wasn’t sure if I should post the entire Open Forum piece here. But it is a must-read to have a clear understanding of the effects of privatization and why it is an “obsession” of “Big Business and their political allies” to get their hands on any pot of taxpayer money they haven’t yet pillaged. Sound familiar? Examples abound, workers and taxpayers be damned. Brilliant comment General. Her Honor, Miller and the other insiders haven’t bothered to visit the lowly trial courts to see the long lines, stacks of unfiled documents and paper and the unhappy citizens who come to the courthouse only to find out it is closed for them. Oh btw those are the same citizens that pay for all this. Meantime back at the crystal palace the overlords will meet, hold forth and laugh at those that dissent and hand out awards. As brilliant as the insiders are , they forgot one of the most important awards. .The Harry Hull Access to Justice and Information Award lol. You can’t make any of this up. Really. And now a word from former AOC money man and current San Bernardino CEO Steve Nash…It pays to be from the Death Star…. “Included in expenditures for this year is the money needed to finalize the move into the new Justice Center, which is expected to be open in San Bernardino next year. “It will cost $1.7 million to move in to our new building in the spring, but that’s a one-time expenditure,” Nash said. That cost covers the moving and implementation costs. The newly passed budget for the San Bernardino County Superior Court system is still not exactly rosy but the prospects for the future are a lot better than they were even just a few months ago. The local Judicial Executive Committee of the court approved the proposed budget for 2013-2014 this week revealing $97.4 million in revenue for this fiscal year but with $112.8 million in expenses, leaving it unbalanced because of substantial state cuts, Court Executive Officer Stephen Nash said. And come July 1, 2014, the courts will end up with a projected reserve fund of $1.8 million. The under-resourced court has taken action to reduce the size of their financial hole, Nash said, but there is still more work to do before they see a balanced budget. In March 2012, the court was looking at a projected shortfall of more than $22 million. But court efficiencies and unexpected state funds bring the current deficit to less than $5 million, Nash said. The expense total in this year’s budget is broken down to three categories. More than $87 million is set aside for personal services, $24 million for operating expenses and equipment, and $791,000 for special items of expense. 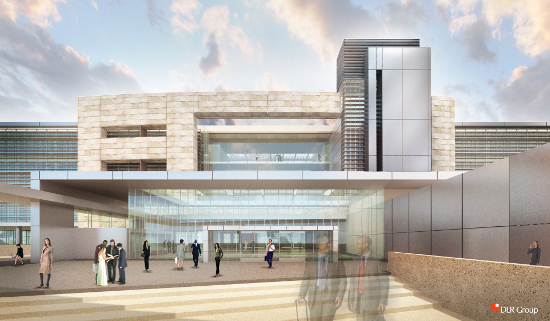 Included in expenditures for this year is the money needed to finalize the move into the new Justice Center, which is expected to be open in San Bernardino next year. 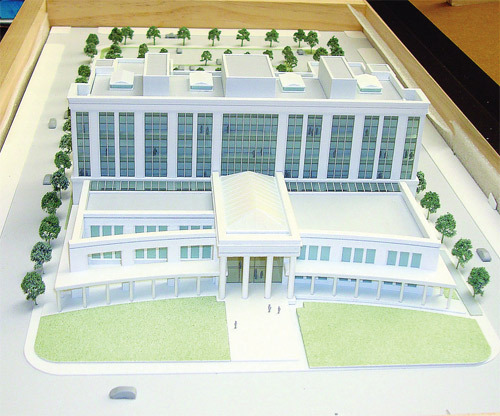 Nash said the state-designed building will be more efficient and larger than the current courthouse. The San Bernardino County courts were hit hard with budget cuts and recently closed courthouses in Chino, Big Bear and Needles. The Barstow courthouse is down to one operating courtroom and clerk office hours were reduced. Nash said he does not see any new cuts or closures on the horizon. In July, San Bernardino County received its share of state funds designated for courts. The county system received $3.4 million, compared to no state funding for the last year. Some of that new money will go toward suspending furloughs for the rest of the fiscal year. Officials also plan to use those funds to increase access to the courts for domestic violence victims and provide additional services for self-help centers. A one-time fund also allowed local court officials to keep one courtroom in the Barstow to stay open for the year.